What Happens to Olympic Host Cities After the Games Leave? Subject: What Happens to Olympic Host Cities After the Games Leave? Since the inception of the modern Olympics in 1896, there have been 49 winter and summer games held in 41 different cities around the globe. Some of these events turned out to be all-around great successes – like Vancouver's Winter Olympic Games in 2010. To this day, all games venues in the city remain in use, with local authorities funding a $110 million trust to make sure that they don't fall into disrepair. For years, researchers have known that hosting large sporting events like the Olympics typically costs more than expected — and always yields less revenue and useful long-term infrastructure than estimated. Holy Cross economics professor Victor Matheson argued in a 2006 report that "Olympic economic impact reports often ignore the significant costs for things like security and conflate 'general infrastructure' with 'sports infrastructure.'" Matheson was, in short, pointing out the skewed priorities of cities who vie to host major sporting events. Because the necessities a community needs to, say, "stage a two-week bobsleigh event" are different than the necessities it needs to maintain average, everyday life. Voters and politicians in democratically elected countries have since picked up on this trend. For example, back in May 2014, potential host cities dropped out of the bidding process for the 2022 Winter Olympics like crazy. Krakow, Munich, and Davos/St. Moritz all withdrew their bids after the public voted against hosting the games. Then Stockholm withdrew after the city's government said that revenue would likely be too low while costs would likely be too high. Eventually, Beijing won the 2022 Winter Games bid in July of last year. While it's true that the Olympics bring unrivaled publicity to a metropolitan area, they oftentimes leave undetermined legacies behind — at best. At worst, once the games are over, host cities are left in poorer shape. Sochi, Russia — Winter Olympics 2014: Russia poured an astounding $51 billion into revamping the beach town into a world-class ski resort. The expenditure dwarfed the cost of previous games. And it came at a terrible environmental price. Casualties include rampant water pollution, thousands of displaced residents, and an entire ecosystem arguably destroyed. Vancouver, Canada — Winter Olympics 2010: This city has arguably fared the best since it hosted the Olympics almost six years ago. Its most successful venue has been the Richmond Olympic speed skating Oval, a widely used community sports facility that attracts more than 550,000 visitors a year. Dozens of sports groups run regular programs at the Oval, which now houses two international-sized rinks for hockey or speed skating, and basketball and squash courts. Plus it has an indoor track and a rowing tank. The venue, which has hosted numerous provincial, national, and international championships in a variety of summer and winter sports, is cited as a positive legacy of the games. A report examining the pre- and post-Olympics period from 2003 to 2011 found that the 2010 Winter Games generated at least $2.3 billion in GDP in British Columbia alone, stated The Huffington Post on Oct. 27, 2011. It also created more than 45,000 jobs. Athens, Greece — Summer Olympics 2004: The 2004 Olympic Games left the taxpayers of Greece with a debt of 7 billion euros (not including the money sunk into a new airport and transportation system), and the mess is regarded by some as a major contributor to Greece's debt crisis. Victor Matheson again offered his take on this via a blog post in The Sports Economist in February 2010. "The Olympics broke the bank," he wrote. "Government deficits rose every year after 1999, peaking at 7.5% of GDP in 2004, the year of the Olympics, thanks in large part to the 9 billion euro price tag for the Games. For a relatively small country like Greece, the cost of hosting the Games equaled roughly 5% of the annual GDP of the country. 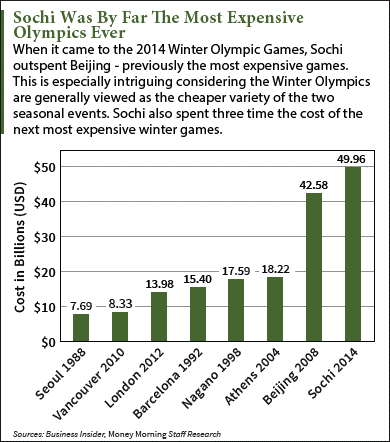 Of course, the Olympics didn't usher in an economic boom. Indeed, in 2005 Greece suffered an Olympic-sized hangover with GDP growth falling to its lowest level in a decade." 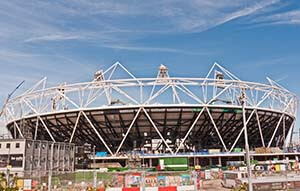 The Olympic Stadium in London under construction in June 2010. London, England — Summer Olympics 2012: The 80,000-seat Olympic Stadium at the center of London's famous Hyde Park is now being converted into a soccer venue which will be the home of the West Ham soccer club. With this conversion comes an expected price tag of $323 million. Many Londoners argue taxpayers should not have to fund a Premier League club, though officials insist that the stadium will continue to host other major sporting events. In London's case, at least, the Olympic site had already earned at least $1 billion more than the $15 billion that had been shelled out, within a year following the event. Projected earnings go into the tens of billions, reported NPR on Feb. 3, 2014. Beijing, China — Summer Olympics 2008: Beijing, which spent more than $2 billion to build 31 venues for the 2008 Summer Olympic Games, is reaping some income and tourism benefits from two flagship venues (the "Bird's Nest" stadium and the "Water Cube"), though many sites need government subsidies to meet hefty operation and maintenance costs. However, it could take 30 years to pay off the $471 million bill for the Bird's Nest, while the Water Cube has lost about $1 million every year since it opened, even after public financial assistance and the addition of a water park, reported CityLab in July 2012. 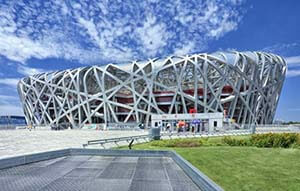 The “Bird’s Nest” stadium in Beijing cost $471 million to build. The next summer Olympic Games are scheduled to begin this August in Rio de Janeiro, Brazil – a city (and country) currently tormented by an economic recession, a looming public health crisis, delayed infrastructure developments, increasing crime rates, and numerous other problems. When Rio first bid for the chance to host the 2016 Olympic Games in 2007, the country was in top shape: Its economy was booming, its middle class had grown by the size of California's in less than a decade, and vast oil discovery off Rio's coast promised a lasting prosperity. Rio's proposal boasted the nation was "well-positioned as a result of its long-term growth, supported by proven economic policies," reported USA Today in July 2015. But now, with less than 100 days to go before the games begin on Aug. 5, 2016, meltdowns in Brazilian politics and the economy — plus plights like the Zika virus and severe water pollution — are consuming the country. The Olympics have all but disappeared from the front pages and TV news, stated Reuters on April 27. With the country in such disarray pre-Olympics, economists and investors alike are concerned about how Brazil will survive once the Olympic Games are over. The price tag for the games rose by 400 million reals ($99.3 million) in January 2015 from its August projected maximum, mainly due to rising costs of supplying temporary power and seating at venues, reported Reuters on Jan. 29. The projected total cost for the 2016 Olympics in Rio, including large infrastructure projects like an extended subway and reformed port area, now stands at 39.1 billion reals ($11.3 billion), about 1% more than originally estimated. All this while the country sits amid its worst recession since the 1930s. The London 2012 Olympics had next to no impact on UK GDP, reported The Globalist on April 16. And in Beijing, the stadiums built for the 2008 Olympic Games still sit empty. Neil Shearing, chief economist for emerging markets at Capital Economics in New York, told International Business Times on Feb. 4, "I suspect the same will be true for Brazil." How Donald Trump Made Fools of the Pundits: It's not only possible, but probable that Donald Trump will shock the world by winning the White House this fall. Such a prediction defies conventional wisdom at the moment. But Trump has an advantage that the political pundits have completely missed. 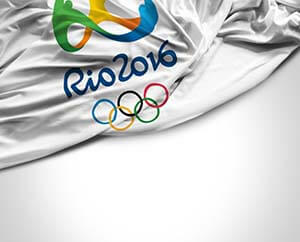 USA Today: Do Rio's Olympics Stand Prayer of Succeeding? The Atlantic: Did the Olympics Break the Greek Government?